Men on Boats is pure fun, asking actors and audience members to pretend, laugh, and play together—from dangling off the edge of a cliff to eating mealy apples around a campfire. 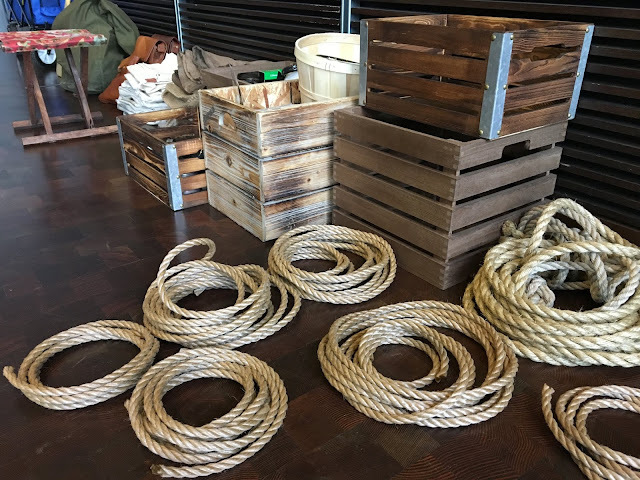 Props Designer Jacquelyn Scott leaned into the sense of playfulness, deciding that some props would be physically present onstage while others would be mimed. “The lack of a physical prop really encourages the audience to use their imagination, and jump in on the action,” says Scott. “The swells and rapids on this daring journey down the Grand Canyon are created by both actor and audience member—it's melodramatic and exciting and fun!” We recently sat down with Scott to hear more about how removing something actually adds to the storytelling in Men on Boats. Men on Boats rehearsal props on display at the first rehearsal. Photo by Elspeth Sweatman. How did you decide which props would be present and which would be mimed? We wanted to find a balance between the set, props, and boats that gave just enough information, but really let the audience stretch their imagination. We introduce a physical item to the audience once, and then never see it again, but recognize it immediately by the physicality of the actor in their handling of this now invisible object. The four boats are especially exciting to watch. The No Name and Kitty Clyde's Sister boats are just the prows, with the rest of them imagined and mimed by the actors. The Emma Dean is portrayed by its captain's chair and life buoy, and the Maid of the Canyon is created with just two oars. We had so much fun with the actors in rehearsals discovering how to create running rapids, falling down waterfalls, paddling and portaging the boats with the minimal tools given to them. Each of the boats really began to take on its own physical vocabulary. As the play progresses, we start losing more and more elements of each boat after catastrophes on the river, so by the end each boat is suggested by just one small item, but we are still right there along for the ride. Did the actors always rehearse without props? No. It was important to give the actors physical props in rehearsals so they could grasp the weight and feel of each item. Like a shotgun, for example. Once you figure out how to hold it and how heavy it is, it's easier to mime. Or ropes. It's much easier to mime a rope once you've thrown an actual one around a few times, or practiced tying nautical knots. It starts to become muscle memory. Which is your favorite prop—physical or imagined? My favorite prop in this show is the snake. It's imagined, and the actors do such a fantastic job selling it. A rattlesnake sound cue and some fancy footwork avoiding a snake bite make me laugh every time. Men on Boats runs through December 16 at A.C.T.’s Strand Theater. Join us on this imaginative adventure, and get your tickets today.